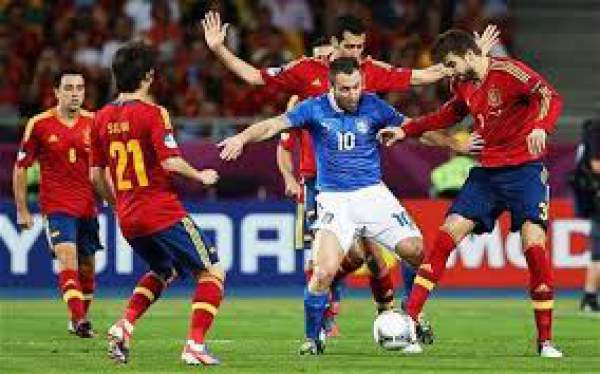 It is Italy playing against the Spanish in Torino for their game. Spain and Italy have Albania, Macedonia, Israel and Liechtenstein alongside them in the group. Spain sit at the top of the table as they won their first game and had three points on the table followed by Italy with three points as well but a worse goal difference than Spain. They played against Israel on the first match day of the pool stage and won the game by 1-3 away from home. Pelle scored the opening goal in the 14th minute of the match to give Italy the lead and then Candreva scored a penalty to make it 0-2 in the 31st minute. After that Tal Ben Haim was able to pull one back for Israel but Immobile scored in the 83rd minute despite Italy being reduced to 10 men in the 55th minute as Chiellini received a second yellow. Spain played their first game against Liechtenstein and won comprehensively by 8-0 to make it their first win in the group stages. Diego Costa scored two; Silva Scored two, Morata who came on as a substitute scored two; Vitolo scored one and Sergi Roberto scored one. Spain had more than 70% possession, had 28 shots on goal out of which 14 were on target. Buffon, Chiellini, Barzagli, Bonucci, Verratti, Parolo, Antonelli, Bonaventura, Candreva, Eder, Pelle. De Gea, Alba, Ramos, Roberto, Pique, Koke, Busquets, Alcantara, Costa, Vitolo, Silva. Both the teams are in good form so nothing can be said here. Previous articleiOS 10 Jailbreak Release Date and Updates: Apple Giving Hard Time To ‘Pangu’ and Other Hackers?